Over 125,000 leading businesses websites like magazines and publishers, hotel and event industry, corporations and enterprises, law firms, universities and community sites across the globe are building on the Umbraco CMS platform. To know Umbraco works with integrated e-commerce, blogs, events calendar, photo & video galleries and much more. A well-known education institute based in Sweden with a skilled staff of experts facilitates booking for educational courses and events. Over-leveraging the power of cloud and internet technologies, the institute wanted to increase their audience by going digital. As online registration offers a seamless workflow when compared to manual registration, the Swedish educationist was seeking for an online portal that provided ease of registration for events and courses. It is at that very point where Rigel Networks came into the picture. They approached Rigel Networks to develop an online portal where its clients can complete its registration for any event or courses with ease. Rigel Networks, looking at the needs of their client, provided a robust online web portal using Umbraco CMS platform. This website not only facilitates online registration of courses and events but also posts their daily updates on their website to let people know more about their organization. The web application development which built on Umbraco CMS platform has features course, event and email management, booking facility, social media integration like Facebook, LinkedIn, Twitter and YouTube. Apart from these features, it also a global search engine. The web portal is built using technologies like ASP.NET MVC 5.0, C#, JQuery, and CSS3, hosted on SQL Server 2016 integrating 3rd party API’s social media – (FB, Twitter, LinkedIn, and YouTube) and PayPal. Through this web application, our client now promotes their business more efficiently with the prior announcement of upcoming courses and events. Other than this, our CMS solution also provided them with the CodeBuddy service to resolve complications, if any, thus increasing their client base. 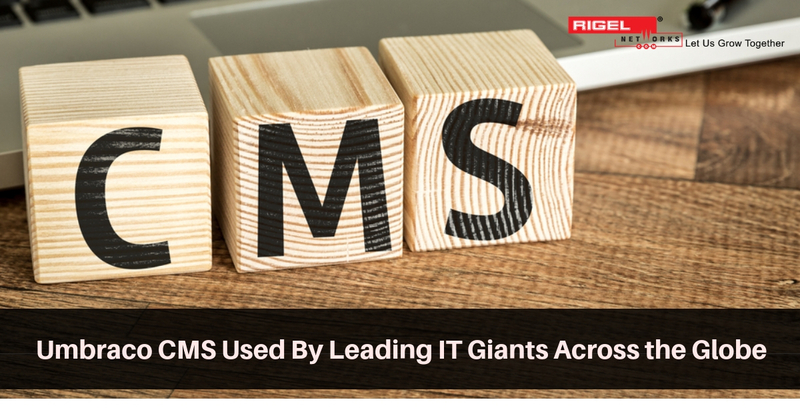 Working for 14+ years, Rigel Networks has been serving big IT giants as well as SMEs across the globe, completing over 100+ projects in different technology services and enterprise solutions. We transform customer’s business by consulting, providing marketing and infrastructure services and deploying technology solutions. Right from the web to mobile application development, infrastructure to virtualization management, cloud computing to IoT solution, we provide sophisticated Software Development Services that result in higher ROI and Performance. Like the Umbraco CMS platform, we work on the best platforms like WordPress, Kentico, Drupal, SharePoint, and more. Rigel Networks assists organizations manage their most important asset, which is the content, with its expert team of certified engineers. With their skilled knowledge, they develop feature rich CMS solutions that ensure authorized information outflow, heavy traffic, flexibility, and high performance.